Artist — Eyebrows Created By Hand, One Hair Stroke at a Time. A graduate of the prestigious PhiBrows Academy, our Phibrows Microblading Royal Artist in Residence has always had an eye for make-up and fashion, and is a natural-born artist. Microblading is all Julie does, day-in and day-out. No hair, nails, other tattoos, etc. Microblading is her sole focus, and she has helped thousands of clients achieve their desired results. 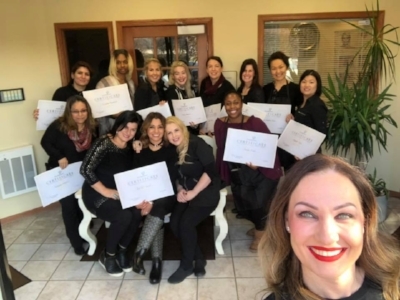 Due to extreme dedication and hard work, Julie has been promoted to the prestigious international designation of PhiBrows Academy ROYAL ARTIST! Julie is 1 of only 300 Royal Artists in the WORLD! Julie has also been chosen as an ASSISTANT TRAINER for PhiBrows and travels the country assisting PhiBrows Masters, including the 2018 Master of the Year! The prestigious, Royal Artist designation is only granted to PhiBrows Artists who receive a unanimous decision vote from all of the PhiBrows Masters of the Academy! In addition to PhiBrows microblading training and Royal Artist designation, Julie is a gifted Artist and holds a Masters Degree in Industrial Hygiene, a Bachelors Degree in Chemistry, and is a Licensed Tattoo Artist with the State of Minnesota. Your safety is of the utmost importance. With 15+ years of industry experience, her expertise ensures our Studio is above and beyond industry safety standards. Julie is extremely passionate about providing the absolute best service for her clients. Microblading is her sole focus, day-in and day-out. She is honored to be your Artist, and will utilize her extensive skills and expertise to dramatically improve to your brows! Important Note: The State of Minnesota requires a minimum of 200-hours of supervised hands-on tattooing experience prior to becoming a fully licensed Tattoo Artist. This is not the case in other states that require little to no experience or training prior to obtaining tattoo licensure. This holds true for some states neighboring Minnesota, such as Wisconsin, that require no training or experience to obtain licensure. Please be sure to research prior to trusting a tattoo artist to perform work. The PhiBrows process is approximately 2 hours in length to incorporate a variety of techniques, precision strokes, superior pigments and digital measurements to ensure hyper-realistic results. The same results can not be achieved in lesser procedures offered by others offering microblading services. Trust your face with the BEST! At Duluth Microblading Studio, we are insured, extensively trained and a certified licensed tattoo establishment by the State of Minnesota! We are extremely passionate about providing the absolute best service for our clients. We are honored to be your Artist, and will utilize our extensive skills and expertise to dramatically improve to your brows. Here's to the Brows You've Always Wanted!